Tissier R., Perrot S., Enriquez B. Amlodipine: One of the main anti-hypertensive drugs in veterinary therapeutics // J Vet Cardiol. 2005 May;7(1):53-8. Amlodipine is a dihydropyridine compound and belongs to the pharmacological family of calcium channel blockers. It is one of the maintreatments of systemic arterial hypertension in cats and its validity has been confirmed in several reports. Its beneficial effect on the peripheral and coronary vascular bed is due to immediate vasodilation and to a delayed anti-hypertrophic action. The aim of the present review is to highlight the clinically-relevant characteristics of amlodipine, especially regarding its mechanism of action, and to present the main clinical reports supporting its interest in veterinary cardiology. 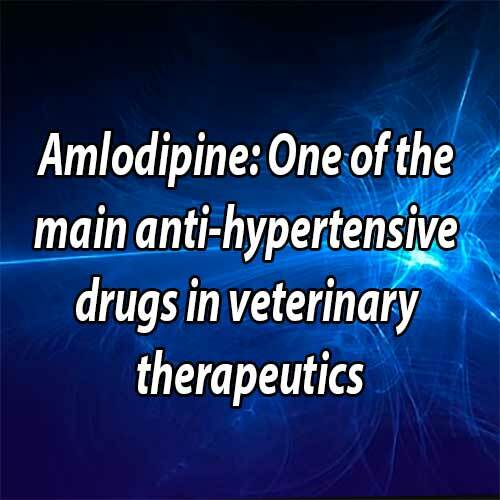 Amlodipine became very popular in veterinary cardiology one decade ago.1 It is one of the main treatments of systemic arterial hypertension in cats and its validity has been confirmed in several reports.2-4 Chemically, amlodipine is a dihydropyridine compound and belongs to the pharmacological family of calcium channel blockers. These blockers, also known as calcium antagonists, elicit a decrease in calcium entry into the cell and lead to an inhibition of: (i) sinoatrial pacemaker activity and atrioventricular conduction, (ii) cardiac ino- tropy and (iii) vascular contraction. The dihydro- pyridines are more active on vascular smooth muscle calcium channels than on cardiomyocytes or sinoatrial cells.5,6 They are sometimes considered as "vasoselective’’ in comparison with other calcium channel blockers, i.e., phenylalkylamines (e.g., verapamil) and benzothiazepines (e.g., diltiazem). The aim of the present review is to highlight the clinically-relevant characteristics of amlodipine, especially regarding its mechanism of action, and to present the main clinical reports supporting its interest in veterinary cardiology. Dihydropyridines can be divided into several generations beginning with nifedipine and nicardipine. Amlodipine is generally used as the besylate salt, which is a white crystalline powder. This salt is a component of several human tablets, e.g., Nor- vasc® (in many countries such as USA and Canada), Amlor® (in France and Belgium), Amlodin® (in Japan) or Amlogard® (in India). The amount of amlodipine in these different types of tablets varies between 2.5 and 10 mg. 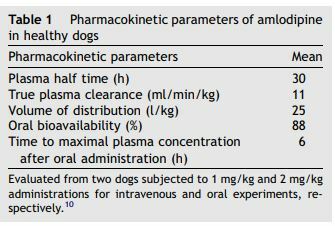 The main pharmacokinetic parameters of amlodipine in dogs, according to the results of Stopher et al.10 are shown in Table 1. The plasma concentration slowly increases throughout repeated administrations, until a plateau is attained after one or two weeks. Amlodipine is metabolized by several phase I reactions such as hydrolysis of the ethylic substitute and degradation or oxidation of the amino side chain.10 None of the main hepatic metabolites showed any significant pharmacological activity. Liver diseases might therefore alter amlodipine degradation, suggesting a need for particular caution in animals suffering from such diseases. The overall excretion of the parent compound and metabolites of amlodipine is equally distributed between the urine and feces. To our knowledge, no specific pharmacokinetic data is available for amlodipine in cats. This is unfortunate in view of the fact that the current principal use of this compound is in these animals. The magnitude of dihydropyridine-induced vasodilation depends on the increase in constriction tone at rest, as in coronary or skeletal muscle vessels. Accordingly, the magnitude of the decrease in mean arterial pressure is related to the increase in pre-treatment blood pressure and venodilation is very mild at therapeutic concentrations.14 Furthermore, the effects of calcium channel inhibition are not only immediate vasodilation but may also be delayed inhibition of vascular hypertrophy and remodeling in rats.15 These anti-hypertrophic properties of calcium channel blockers are obviously relevant in the context of systemic hypertension, since this disease alters cardiac morphology in cats.16 Finally, amlodipine is an original calcium channel blocker as it brings about the activation of nitric oxide synthase enhancing vasodilation in dogs.17 This further confirms the therapeutic interest of amlodipine in systemic hypertension. Dihydropyridines also exert indirect effects on the myocardium in dogs by increasing coronary flow and decreasing afterload in dogs.13 These phenomena result in favorable myocardial anti-ischemic effects and enhance a slight inhibition of calcium ischemic overload, e.g., in rats.18 This inhibition is directly due to a decrease in ischemic calcium entry into the cardiomyocytes. It should be emphasized that although acute ischemic myocardial diseases are very rare in veterinary cardiology, short subclinical ischemic episodes may be involved in myocardial remodeling and accelerate the evolution of compensated hypertrophic cardiopathy to cardiac failure.19 The potential anti-ischemic properties of amlodipine should therefore be considered as interesting. We have already emphasized that amlodipine elicits arteriolar vasodilation and afterload reduction, suggesting its possible use in heart failure and systemic hypertension. Its main interest is, however, limited to the treatment of systemic hypertension although the cardiac depressive effects are slight. Since such a disease has mainly been described in cats rather than dogs, most of the clinical reports have been devoted to this species. 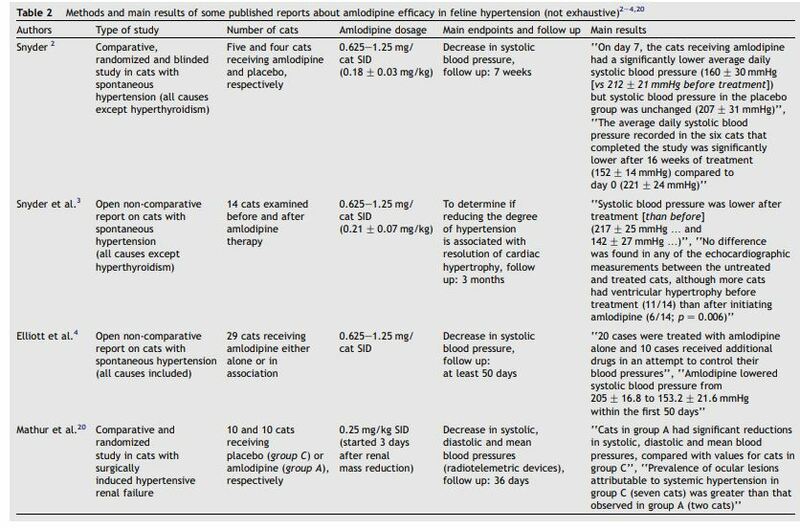 Table 2 shows the methodology and conclusions of some of the clinical reports on which the effectiveness of amlodipine as an anti-hypertensive in cats is based.2-4,20 This property was mainly observed in essential hypertension and secondary to chronic renal failure. One of the reports shown in Table 2 also included cats with hypertension and concomitant hyperthyroidism (seven out of 30 cats).4 Mathur et al.20 further demonstrated in surgically induced hypertensive renal failure that secondary lesions attributed to systemic hypertension, e.g., retinopathy, were prevented by the decrease in blood pressure induced by amlodipine. This compound seems therefore to be one of the best anti-hypertensive drugs in cats since angiotensin converting enzyme inhibitors and b-blockers led to disappointing results in first line treatments.4,21 However, no prospective, blinded and comparative trial involving amlodipine and these other drugs has been performed to confirm this clinical observation. 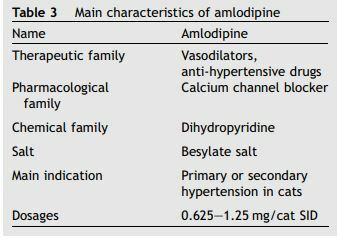 Finally and as shown in Table 2, the use of amlodipine has been proposed by Snyder et al.3 in systemic hypertension associated with myocardial hypertrophy. However, the effect of amlodipine in such a context has not been prospectively and blindly compared to that of other treatments (e.g., diltiazem or b-blockers). In comparison with feline medicine, canine cardiology has not been focussed on systemic hypertension as this is seldom observed. Many experimental investigations have demonstrated that dihydropyridines are able to decrease arterial pressure in dogs22,23 but no large prospective clinical trial has been carried out to determine amlodipine efficacy in canine hypertension. Some veterinary cardiologists seem to prefer angiotensin converting enzyme inhibitors or b-blockers on the basis that the decrease in blood pressure induced by amlodipine in dogs is disappointing compared to the effects observed in cats. Several clinical reports on hypertension in cats conclude that amlodipine at the usual dosages (0.625-1.25 mg/cat, SID) is very well tolerated and that excessive pharmacological activity, e.g., an excessive decrease in mean arterial pressure, is very rare.2-4,20 Elliott et al.,4 however, reported one case of hypotension in one cat treated with both amlodipine (0.17 mg/kg SID) and propranolol (0.35 mg/kg TID) out of 30 cats treated with amlo- dipine alone or in combination. This suggests that blood pressure should be particularly monitored in the few animals receiving several anti-hypertensive drugs. Special caution would, in theory, be also required in patients with hepatic disease as amlo- dipine is highly metabolized by the liver. 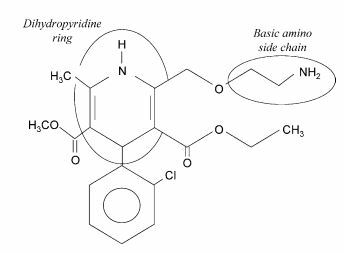 In conclusion, and as shown in Table 3, amlodipine belongs to the dihydropyridine family of calcium channel blockers. It is a vasoselective drug with slight cardiac effects. Its beneficial effect on the peripheral and coronary vascular bed is due to immediate vasodilation and to a delayed antihypertrophic action. Amlodipine can thus be considered the "gold standard’’ for the treatment of systemic hypertension in cats. Henik RA, Snyder PS, Volk LM. Amlodipine besylate therapy in cats with systemic arterial hypertension secondary to chronic renal disease. J Vet Intern Med 1994;8:147 [abstract]. Snyder PS. Amlodipine: a randomized, blinded clinical trial in 9 cats with systemic hypertension. J Vet Intern Med 1998; 12:157-62. Snyder PS, Sadek D, Jones GL. Effect of amlodipine on echocardiographic variables in cats with systemic hypertension. J Vet Intern Med 2001;15:52-6. Elliott J, Barber PJ, Syme HM, et al. Feline hypertension: clinical findings and response to antihypertensive treatment in 30 cases. J Small Anim Pract 2001;42:122-9. Millard RW, Grupp G, Grupp IL, et al. Chronotropic, inotropic, and vasodilator actions of diltiazem, nifedipine, and verapamil. A comparative study of physiological responses and membrane receptor activity. Circ Res 1983; 52:I29-39. Ohtsuka M, Ono T, Hiroi J, et al. Comparison of the cardiovascular effect of FR34235, a new dihydropyridine, with other calcium antagonists. J Cardiovasc Pharmacol 1983;5:1074-82. Aouam K, Berdeaux A. Dihydropyridines from the first to the fourth generation: better effects and safety. Therapie 2003;58:333-9. Gutierrez LM, Lesko LJ, Whipps R, et al. Pharmacokinetics and pharmacodynamics of nifedipine in patients at steady state. J Clin Pharmacol 1986;26:587-92. Meredith PA, Elliott HL. Clinical pharmacokinetics of amlodipine. Clin Pharmacokinet 1992;22:22-31. Stopher DA, Beresford AP, Macrae PV, Humphrey MJ. The metabolism and pharmacokinetics of amlodipine in humans and animals. J Cardiovasc Pharmacol 1988;12(S7):55-9. Booth DM. Treatment of cardiovascular diseases. In: Booth DM, editor. Small animal clinical pharmacology and therapeutics. Philadelphia: WB Saunders; 2001. p. 553-601. 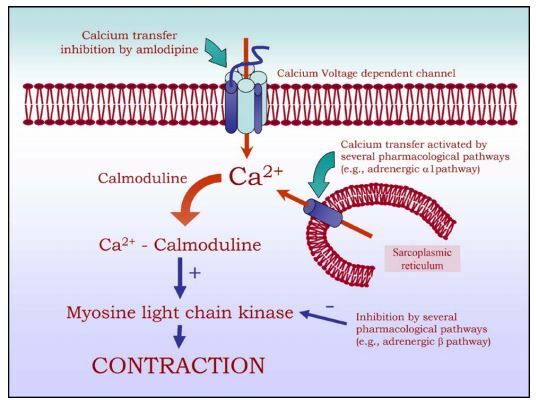 Scholz H. Pharmacological aspects of calcium channel blockers. Cardiovasc Drugs Ther 1997;10(S3):869-72. Dunlap ED, Plowden JS, Lathrop DA, Millard RW. Hemodynamic and electrophysiologic effects of amlodipine, a new calcium channel blocker. Am J Cardiol 1989;64:71I-7I. Cooke KL, Snyder PS. Calcium channel blockers in veterinary medicine. J Vet Intern Med 1998;12:123-31. Sharifi AM, Li JS, Endemann D, Schiffrin EL. Effects of enalapril and amlodipine on small-artery structure and composition, and on endothelial dysfunction in spontaneously hypertensive rats. J Hypertens 1998;16:457-66. Chetboul V, Lefebvre HP, Pinhas C, et al. Spontaneous feline hypertension: clinical and echocardiographic abnormalities, and survival rate. J Vet Intern Med 2003;17:89-95. Zhang X, Hintze TH. Amlodipine releases nitric oxide from canine coronary microvessels: an unexpected mechanism of action of a calcium channel-blocking agent. Circulation 1998;97:576-80. Nayler WG. The effect of amlodipine on hypertension- induced cardiac hypertrophy and reperfusion-induced calcium overload. J Cardiovasc Pharmacol 1988;12(S7):42-4. Vatner SF, Hittinger L. Coronary vascular mechanisms involved in decompensation from hypertrophy to heart failure. J Am Coll Cardiol 1993;22:34-40. Mathur S, Syme H, Brown CA, et al. Effects of the calcium channel antagonist amlodipine in cats with surgically induced hypertensive renal insufficiency. Am J Vet Res 2002;63:833-9. Jensen J, Henik RA, Brownfield M, Armstrong J. Plasma renin activity and angiotensin I and aldosterone concentrations in cats with hypertension associated with chronic renal disease. Am J Vet Res 1997;58:535-40. Yamamoto N, Nomura M, Okubo K, et al. Pharmacologic characterization of FR172516: a new combined calcium channel-blocking and beta-adrenoceptor-blocking agent. J Cardiovasc Pharmacol 1999;33:587-94. Ishida Y, Tomori K, Nakamoto H, et al. Effects of antihypertensive drugs on peritoneal vessels in hypertensive dogs with mild renal insufficiency. Adv Perit Dial 2003; 19:10-4.